I won’t insult your intelligence by suggesting that this is some great bake, or indeed, a new idea. I got the inspiration from a coffee chain’s pistachio and amaretti tiffin, but decided to recreate it with my own additions. As with all tiffin, it is very, very simple and a (excluding the amaretto soaked cherries) great thing to make with the kids. It would also make a lovely Christmas gift or addition to serve with coffee at the end of a meal. Extra Pistachios, freeze Dried Cherries or sprinkles to decorate. Begin a day or two before you want to make the tiffin by soaking the dried cherries in the amaretto. The cherries will plump up and taste delicious. Line an 8′ square baking tray. Melt the butter and golden syrup in a saucepan over a gentle heat. Crush the amaretti biscuits fairly finely, then stir through the chopped pistachios and cocoa powder. Once the butter and golden syrup have melted, add the soaked cherries to the mixture then tip it in with the crushed biscuit mixture and stir well. Put it into the prepared tin, spreading it out evenly and pressing down to form a fairly smooth surface. Allow to firm up. Once the tiffin is firm, melt the milk and dark chocolate and spread evenly over it. Sprinkle finely chopped pistachios and freeze dried cherries on top. I happened to have the cherries, and wouldn’t buy them especially for this: red sprinkles would be just as effective. I took some in to work and everyone thought it was a very decadent and grown up tiffin. I hope that you try it over the festive period and enjoy it too. It’s that time of year again when I get obsessed with all things autumnal, and, in terms of baking, I love spices like cinnamon, ginger and cardamom, and to use apples, pears, and nuts as key ingredients. Of course, I have succumbed to the American invasion of pumpkin, and love to bake with it during the months leading up to Christmas. It used to be near impossible to get canned pumpkin in the UK, but it is slowly becoming easier to find. When I do find it, however, I tend to stock up, just in case. I decided to make another bundt cake recipe that I could top with another favourite ingredients of mine, maple butter. If you cannot get any, simple make an icing with equal parts maple syrup and icing sugar. So, this is a *big* cake. Don’t make it for just you and your friend having coffee together. I used a large bundt tin. I suppose you could half all of the ingredients and make it in a smaller bundt tin, a regular tin, or even a large loaf tin (or two.) It’s also a cake to have with coffee rather than a gooey, squidgey dessert type of cake, if you know what I mean. It is a super easy method, using ideas cobbled together from various pumpkin cakes that I’ve tried in the past. I found that the flavours develop and the texture improves when eaten the day after. Mix most of the dry ingredients together in a large bowl: the plain flour, bicarbonate of soda, pumpkin pie spice, and salt. Remove 70g of this dry mixture and place in a smaller bowl (to coat the chopped apples with) and leave the remaining to one side. Now whisk together the can of pumpkin purée, the oil, the eggs, and the vanilla in a another large bowl. Then mix through the caster sugar. Peel, core and chop the apples. Put them in the bowl of 70g of flour mixture and toss them until they are completely coated. Chop the pecans, keeping them quite large. Add the dry to the wet ingredients and whisk until completely incorporated. Pour into a prepared large bundt tin and bake for about 50 minutes. It will rise slightly above the sides of the tin but should not spill over. Allow to cool for 5 minutes in the tin then turn out to cool completely. Make the icing by melting the Moose Maple Butter then whisk in the icing sugar until you have a smooth, fluid icing. Pour over the cooled cake and scatter with pumpkin seeds (or chopped pecans if you prefer.) If you cannot get the butter, then whisk 100g of maple syrup with 100g of icing sugar and use that instead. I hope that you enjoy my latest cake and can forgive me for my obsession with all things autumn. The final cake, though I wouldn’t pipe icing around the top or use fresh cherries next time. This is a cake that I adapted from a recipe that I found in delicious. magazine. I made the original a couple of months ago but didn’t care for the icing at all. I decided I wanted to nail a cake with cherry and almond flavours, that featured white chocolate, but it couldn’t be cloying or heavy. I also had various visions of how the final cake would be decorated. But I think I made it too fussy and old fashioned on this occasion and would definitely scale back a bit next time. But I thought it would be helpful to include the process to show that it usually takes a few attempts to get to where you want to be. Before you start baking it is a good idea to make your white chocolate bark or shards for the sides of the cake. I didn’t execute mine especially well the first time: I didn’t temper the chocolate (naughty Frances!) and left it too thick. Melt the 150g of white chocolate (temper it if you can) and spread it out thinly on some sheets of greaseproof paper, then carefully roll it up around a cardboard tube. Allow to cool then pop it in the fridge or freezer. Grease and line two 8″ deep sided sandwich pans. Preheat the oven to 170C (or 150C fan). Sieve the flour and baking powder into a large bowl, and stir through the ground almonds and 200g of the caster sugar. Whisk the egg whites in a clean bowl until foamy, add the cream of tartar, then whisk until soft peaks. Gradually add the remaining 100g of caster sugar as if you are making meringue. In a separate bowl, whisk the egg yolks until creamy, then add the vanilla and almond extracts and the oil. Mix well. Add the egg yolk mix to the dry mix. It will be a thick paste like above. Add a heaped spoonful of the egg white mixture to loosen the egg yolk mixture (which is very stiff) then fold in the rest of the egg whites. Divide the mixture between the two baking pans and bake for 30-35 mins until risen, golden and firm. Allow to cool on a rack for 10 minutes, then remove from their pans and cool completely. They will sink a little in the middle, so don’t worry. Make the Kirsch syrup whilst the cakes are cooling. Put the sugar, water and kirsch in a saucepan on a low heat and stir until the sugar dissolves. Allow to cool. When the cakes have completely cooled, level their tops and pour the syrup over both of them. Now make the White Chocolate Cream. Carefully melt the white chocolate in a bain marie. Sieve the icing sugar into the double cream and whip until very soft peaks. Pour the melted white chocolate into the whipped double cream and whip again. Be very careful not to over whip. You want firm peaks but not dry or split. Spread the cherry jam over one of the cakes, followed by a good layer (about 1cm thick) of the icing. Place the other cake on top, cut side down. Now cover the cake gently (to avoid getting crumbs through the icing) and evenly all over. If using freeze dried cherry pieces, put them in a food processor and whizz up until they are like dust. Sprinkle this through a sieve on the top of the cake. Unwrap the cold or frozen white chocolate. It will break into shards. Press the sides into the side of the cake until it is covered. As you can see from my top photograph, I piped icing and placed fresh cherries on the cake. Next time, I will leave it with the freeze dried cherries and white chocolate shards, but you can choose whatever way you want to decorate, and I appreciate that you may not want to order some freeze dried cherries for a one off. You may not even want to bother with the white chocolate on the side (or buy some ready made white chocolate shavings.) If so, don’t worry, you will still get the chocolate flavour through the white chocolate cream. The cake would also look beautiful with just the icing and a few piped rosettes and fresh cherries. Or if you wanted some crunch, some slivers of almonds pressed around the sides would also be delicious and pretty. I should have stopped here! Less is often more in my book. Keep the cake cool until you are ready to serve because of the fresh cream, but it will still be enjoyable after a night in the fridge if it doesn’t all get eaten on the day it’s made. I can’t take much credit for this recipe: it is based on an old favourite of mine from BBC Good Food magazine, Blackberry and Coconut Squares. I did reduce the amount of sugar and change the flavourings, however. It came about because I saw a large carton of fresh cherries reduced at the supermarket and decided to buy them and give the recipe a new twist. I find with fruity recipes, that I like to alter them according to the season and what’s easily available. Preheat oven to 180C (160C fan oven) and line an 8″ square baking tin. Put the flour, oats, sugar and butter in a large bowl and rub together until it resembles breadcrumbs. Mix through the ground almonds. Weigh out 150g of this breadcrumb mixture in a separate bowl and add the flaked almonds to it, and mix through again. Break the eggs into a bowl and add the almond extract. Beat the eggs lightly. Add the egg mixture to the remaining breadcrumbs mixture and stir through. It will be a thick and sticky batter. Put the batter into the lined baking tin and spread it as evenly as you can. Spread the prepared fresh cherries over the batter, pressing a few in. Spread the breadcrumb and flaked almond mixture over the cherries, clumping some of it in your hand as you go. Bake in the oven for about an hour until the top is golden and crunchy and the inside firm. If the top looks as though it is going to burn, cover loosely with foil. Remove from the oven and allow to cool if you wish to cut it into tidy squares or serve warm with custard, cream or ice-cream as dessert. I am already thinking of how I can adapt this for orchard fruits in the autumn, with plums and cinnamon a firm favourite. I hope you enjoy this summery traybake. This cake is a combination of tweaked recipes from elsewhere and my own imagination. It came about because of my recent obsession with elderflower. I have always loved the flavour of elderflower and knew that people gathered the flowers and made their own cordial and wine, but for some reason I assumed it didn’t grow in Scotland. But since getting our puppy, then moving to our new house and village, I have become much more aware of the passing seasons and the flowers, trees and plants around me. I had a rough idea of what elderflower looked like but wasn’t sure. Then I saw some flowers that I thought might be it whilst out on a walk with the dog. I photographed it and had it confirmed by my friends on a Facebook group, who are keen cooks and bakers. I researched more about collecting and making cordial and decided to give it a try. I decided to use The River Cottage recipe which was very straight forward and easy. During the process I did doubt how it was going to taste because it didn’t smell especially edible when I poured the boiling water on the flower heads, but all came good by the morning after the sugar and lemon and orange juice had been added. I had been thinking of how best to use this summer flavour in a desert or cake for Father’s Day, and eventually took inspiration from a strawberry cake that I had previously made using a BBC Good Food recipe. The Queen of Hearts cake that I made using a recipe from BBC Good Food (link at the end of the post). I won’t pretend that this cake is super fast, but if you have the time and patience it’s worth it for a special family occasion and is very summery. Of course, making your own cordial is completely optional: I just had a bee in my bonnet about trying it out. I do actually have some ready made in a bottle in my kitchen from Ikea. You will also need two 8″ round sandwich tins, and a loose bottomed 7″ deep sided round tin. Grease and line the two 8″ sandwich tins and preheat the oven to 180C or 160C fan. Cream the butter and sugar until pale and fluffy, then very slowly add the eggs. Add a spoon of flour if you are worried about the mixture cuddling. Add the vanilla and cordial and mix in gently. Split the mixture between the two tins, smooth out and bake for 20 minutes. Allow them to cool a little for a few minutes before turning out to cool completely. Whilst the cakes cool, make the strawberry cream for the filling. Wash and remove the stalks of 150g of strawberries. Put them in a food processor or blender with 75g of icing sugar and blend until smooth. Soak the two gelatine leaves in some cold water. Put the strawberry puree in a saucepan with the cordial and warm through. When it is hot (not boiling) squeeze the excess water from the gelatine leaves and add them to the strawberry mixture and stir until dissolved. Put this mixture to one side and allow to cool completely. You can pop it in the fridge to speed this up. Meanwhile, wash and remove the stalks of the remaining 300g of strawberries for the filling. Try to gather strawberries of a similar size and half them. These are going to line the tin so should be as uniform as possible. Chop up the rest of the strawberries (it’s a good idea to wait to do this until after you’ve lined the tin with the halved strawberries first). 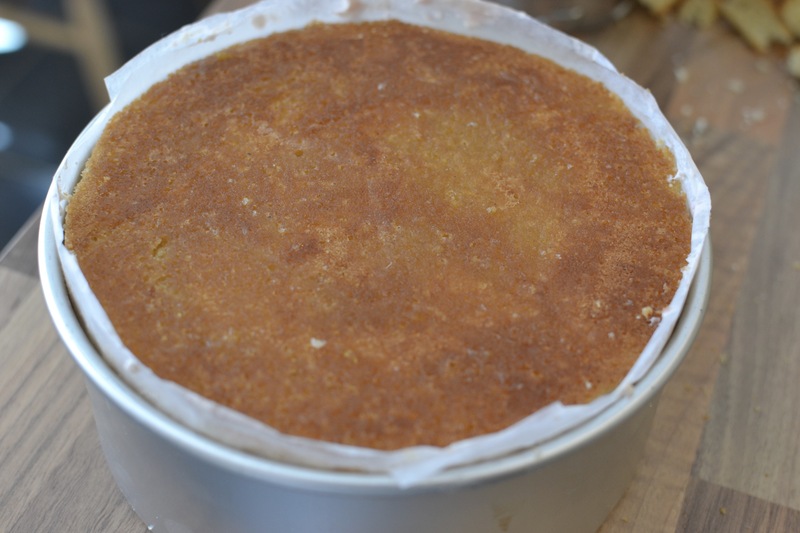 Once the cakes are cool, line the 7″ tin with greaseproof paper. Trim the sponges to the exact size as the tin, and level off the tops so that they are even. Place one sponge on the bottom of the tin. It will be a snug fit. Drizzle or brush 50ml of the cordial over the sponge at the base of the tin. Now line up the uniform strawberries inside the tin with their cut edge facing outwards. Scatter the rest of the cut strawberries inside the ring of strawberries. Make the strawberry filling by whisking the 300ml of double cream until firm then folding in the cooled strawberry puree. Gently add the strawberry filling to the tin, making sure it goes between all the gaps between the strawberries, especially the ones lining the tin. Give the tin a gently tap on the work top to help ensure the gaps are filled. Smooth the top off. Place the second cake on top and soak the remaining 50ml of cordial over it. Place the cake in a fridge to firm up for at least an hour, but your could leave it longer. When you are ready to finish the cake off, whip up the remaining 200ml of double cream with 3 tablespoons of cordial until firm enough to pipe. Remove the cake from the tin as carefully as you can. Using a sieve, sprinkle the centre of the cake with icing sugar. Then pipe the elderflower flavoured cream around the top edge before placing the last of the strawberries and fresh elderflowers on it. If you were not going to eat the cake within the hour I would pop it back in the fridge to help it to keep its shape, but remove it about half an hour before you want to eat it. I came up with this recipe for my old school friend who was coming over for coffee. I asked her what her favourite cake flavours were and she said: coffee, coconut, fruit and dark chocolate. I decided coffee and chocolate was a good way to go. I’ve long been a fan of Annie Bell’s Coffee and Walnut cake. Her coffee and mascarpone cream is so very delicious: it’s creamy but not clawing; and it feels luxurious and decadent, but is incredibly simple to make. The topping is almost identical to Annie Bell’s, so I can’t take credit for how delicious it is. But I decided I wanted to make more of a coffee sponge, incorporating chocolate, and leaving out the nuts on this occasion (though you could always sprinkle chopped walnuts on the top if you fancy). I also wanted to add more flavour and moisture by using a sugar syrup on the cake itself. Preheat the oven to 180C (or 160C fan) and grease and line a 7″ round cake tin. Beat the eggs with the instant coffee until the coffee is dissolved. Slowly add the egg and coffee mixture to the creamed butter and sugar, mixing well between additions. Add a teaspoon of flour to prevent curdling. Fold in the flour then fold in the chocolate chips. Put the batter in the cake tin and smooth the top, then bake for 35-40 minutes until risen, dark golden and a skewer comes out clean. Allow to cool in the tin for ten minutes whilst you make the syrup. Warm the water, Tia Maria (if using), sugar and coffee in a pan over a gentle heat until the sugar is dissolved. Pierce the cake all over with a skewer. Slowly our the syrup over the cake, focusing on where the cake is pierced. To make the topping, simply add all the ingredients to a bowl and mix together gently: it does not need to be whipped. I find it pipes better when firm, so chill in the fridge for 15 minutes if you intend to pipe it. Spread or pipe over the cooled cake and sieve some cocoa over the top. If you fancy using chocolate coated coffee beans then finish off with these. Alternatively, you could grate dark chocolate over the mascarpone cream if you prefer. Serve with your favourite hot drink: we enjoyed ours with mugs of coffee. I hope you enjoy making this quick and easy coffee cake. This recipe came about simply from chancing upon some very pretty apricots at the supermarket. I thought they would be delicious in a frangipane type tart, but then wondered what it would be like to substitute pistachios for the traditional almonds. There was only one way to find out; and I was delighted with the result. I have to say, though, that it’s maybe not the prettiest tart that I’ve ever made, and almost looks savoury. But I can assure you that it is sweet and delicious. Preheat your oven to 180C. Roll out the pastry and line an 8″ tart tin with it, leaving the excess to hang over the edge. Prick the base with a fork several times and refrigerate for at least half an hour. Whilst the pastry is chilling prepare the apricots by cutting them in half and removing the stones. Place 100g of the pistachios in a food processor and blitz them until they are fine, small pieces (they don’t need to be quite the powder of ground almonds but close). Line the pastry case with greaseproof paper and fill with baking beans and bake blind for 20 minutes, then remove the lining paper and beans and put it back in the oven to dry out the base for a further 5-10 minutes. Once blind baked leave the pastry case to one side and make the filling. Cream the butter and sugar until light and fluffy. Add the eggs to the butter and sugar mixture one by one, with a dessert spoon of flour to stop them from curdling. Once both eggs have been incorporated, add any remaining flour plus the 100g of ground pistachios and mix well. When I first made this, I poached the apricots, but soon realised there was no need to do this, hence them looking already cooked in the picture above. Spread the pistachio mixture out over the base of the tart case, then add the cut apricots (cut side down) on top. Roughly chop the remaining 50g of pistachios and scatter over the batter. Bake for 30-40 minutes until the batter is firm. Watch the edges of the pastry for catching and cover loosely with foil of you think there is a risk of the top burning. Allow to cool in the tin. Trim the excess pastry from the top of the tart and serve on its own or with cream. I hope you give this tart a try if you are a fan of pistachios whilst the apricots are in season.